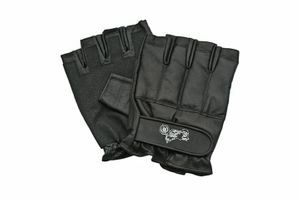 Fingerless Half Finger Shot Gloves SAP brand all going for $17.78 a pair. Our Fingerless Shot Gloves are great for bikers, law enforcement and athletes and on sale. They are made with premium heavy-duty leather, double-stitched seams and have steel shot sewn into the knuckles. These weighted half-finger gloves are high quality which are not only comfortable, but also offer you some serious added protection for your hands. This model has added wrist strap to tighten around your wrist. All these gloves are not for hitting a bag. They might also serve as exercise gloves, adding weight without involving your grip. Great for boxers and martial artists and other fighters. Not available for sale to MA, CA or NY. Fit absolutely perfectly. Well made, tough materials. Defense Corp Rocks!